Department of Aerospace Engineering Samuel P. Langley Distinguished Professor James E. Hubbard, Jr. has been named the recipient of the International Society for Optics and Photonics' (SPIE) 2016 Smart Structures and Materials Lifetime Achievement Award. At the University of Maryland (UMD), Hubbard heads up the Morpheus Laboratory, a dynamic research facility focused on aerospace applications of smart materials and adaptive structures, where his research areas involve the design, analysis, simulation and fabrication of spatially distributed systems, smart materials, smart structures and smart transducers. In 2009, Hubbard was recognized by American Society of Mechanical Engineers (ASME) as one of the early pioneers of the field of Smart Structures. He has received numerous awards for teaching and mentoring excellence including the Massachusetts Institute of Technology (M.I.T.) Goodwin Medal for “Conspicuously Effective Teaching,” The M.I.T. Steward Award for “Outstanding Service to the Community,” and in 2002, he was awarded “The Key to the City” of his hometown of Danville, Va. for lifetime achievement and mentoring. 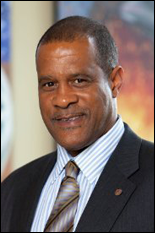 Over the years, he has received many awards for his application of smart materials including the Charles Stark Draper Engineering Vice Presidents Annual Award for Best Technical Patent and the 2002 Black Engineer of the Year President’s Award. During his career, he has participated on panels, chaired sessions and given plenary and keynote presentations at numerous conferences across the fields. In addition, he has more than 100 technical publications, 24 patents—U.S. and worldwide—in the areas of smart structures and photonics, and has served on numerous technical boards and committees including the American Helicopter Society (AHS), American Institute of Aeronautics and Astronautics (AISS), and the National Academy of Engineering (NAE) in a career spanning some 30 years. Hubbard holds a B.Eng., M.S. and Ph.D. in Mechanical Engineering from the M.I.T. in 1977, 1978 and 1981, respectively. He began his career in 1971 as an engineering officer in the U.S. Merchant Marine serving in Vietnam. At the age of 19, he was one the youngest to receive an unlimited horsepower, steam and diesel engine Marine Engineering license from the U.S. Coast Guard. In 1981, he joined the faculty at the M.I.T. and served as Assistant Professor of Mechanical Engineering. There he distinguished himself by winning an IBM Young Faculty Development Award, before going on to become the Section Chief of Adaptive Sensors at the Charles Stark Draper Laboratory in 1985. At the Draper Lab, he pioneered the application of smart structures in applications as diverse as adaptive optics, phased array sonar and large space structure vibration control. He has served as the 1st Chief Engineer of the Boston University Photonics Center, a $100M investment by Boston University (BU) and the U.S. Government in photonics research. During his tenure at the BU Photonics Center, he co-founded two companies whose commercial product base built on his experience in smart materials, smart structures and smart material sensors. In 1999, his product line was recognized with SPIE's Smart Structure Product Innovation Award. Hubbard is the fifth Clark School faculty member to receive this award. He joins Mechanical Engineering Minta Martin Professor Amr Baz and Aerospace Engineering colleagues Alfred Gessow Professor and Distinguished University Professor Inderjit Chopra, Professor Alison Flatau, and Department Chair and Minta Martin Professor of Aerospace Engineering Norman Wereley.